On March 2nd AEDT, 2014 @ 03:23:31, the planet Mars will Station retrograde for a prolonged period of 79 days. During this retrograde passage several interesting planetary configuration will take place. Here in Australia these configurations may affect our current Prime Minister Tony Abbott. Mr Abbotts birth data is; 04:00hrs GMT 00:00, November 4 1957, London, UK. These influences may also directly concern the nation as the 4 angles or pillars of both the Federation-Midnight and Proclamation charts of 1st January 1901, will be activated. 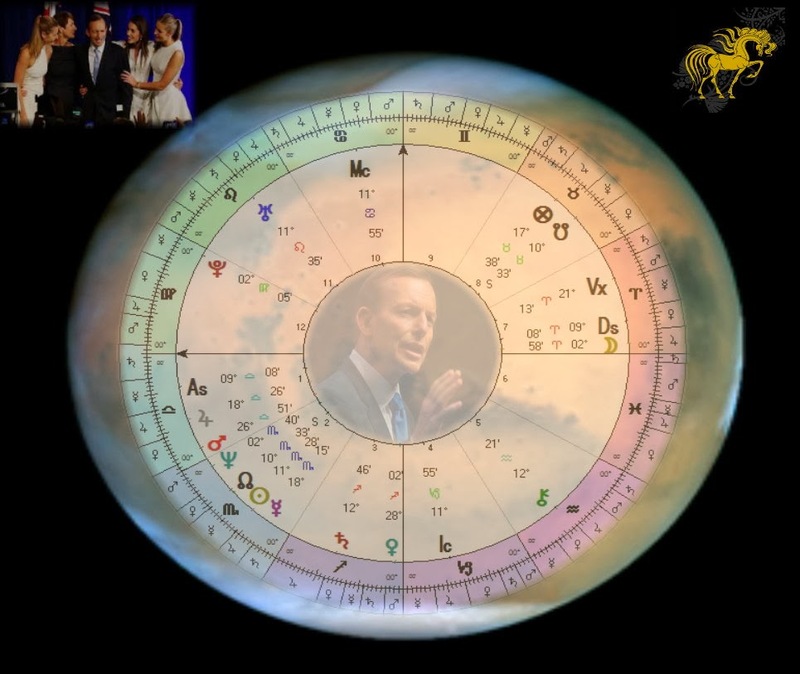 Minister Abbott has his natal Mars at 26° Libra 51' . And if his reported birth time is correct he has 9° Libra 08' rising. The significants of this is intriguing as transiting Mars stations retrograde on his natal Mars and stations direct on his natal ascendant. The retrograde phase of a planet is likened to backward-looking, something needs our or its attention for whatever reason. In Abbotts case if his birth time is correctly stated then the areas that will come under consideration are the 2nd house and 7th house. His natal Neptune/North Node/Sun and Mercury are in Scorpio and his natal Moon is in Aries. Natal Mars is in the first whole sign house. The energies associated with the red planet can vary according to the planets essential dignity. Abbotts has a nocturnal chart (meaning the Sun is below the horizon) so Moon, Venus, Mars and Mercury are said to be of Sect. These planets will aid and assist him by removing (separating, cutting and dividing) complexities to his growth. The level of support each of these planets gives is subject to the planets dignity. Natal Mars is diametrically opposed to its Home sign, Aries. This can be seen as having difficulty accessing the planets resources and may manifest through the level of cooperation or reliance on others to support him. This is reinforced by the presence of the unpredictable Uranus transiting upon his 7th house cusp, descendant. Tony has a natal chart associated with reliance on others, his Sun in Scorpio is co-joined to the North Node and the transiting retrograde passage is highlighting this as Mars is about to adhere to the transiting regressing node but falls short and retreats. On March 5 2014, transiting Aries Moon co-joins the South Node, opposing transiting Mars/North Node emphasizing this theme of retrospective action. An interesting twist is transiting Venus is square Mars and transiting stationary direct Mercury on March 1 will square natal Mercury. Abbotts natal Mercury rules his 12 and 9th houses. His natal Mercury is said be combust owing to its closeness to the Sun, however due to Mercury's presence in his own Chariot this condition is diminished. Abbotts progressed Moon is at 22 Aries and opposing both natal and transiting Mars. The solar arc chart shows some very dynamic action taking place with solar arc Uranus upon his natal ascendant and solar arc Moon just entering Gemini. Finally this may involve Tony's immediate family. Abbott is in his 56 Profected year and the house is the 9th place from the ascendant and the ruler is Mercury so the condition of Mercury will know doubt have a big say on how this plays out. His solar return features return Mercury co-joined to North node and Moon co-joined to Saturn. Over the coming weeks given my available to time I will update this article.